I used to go to my local mall to get ornaments engraved for my nieces and nephews. No more. Now I can order from Miles Kimball, and they arrive looking just like the mall ornaments, perfectly engraved, at a fraction of the price and with NONE of the hassle of having to find a parking spot, wait in line, Choose from their limited selection, etc. I'll be buying ornaments from here from now on! Colors are very vibrant and just very cute! My son loved it! great way to say I'm thinking of you without spending a lot of money. Very cute ornament, something she will treasure. I'm sure she will hang it on the tree the moment she gets it. I love the ornament. My only complaint is I ordered all my ornaments at one time on a discount and free shipping, but most were canceled and this one wound up costing me more than I anticipated because it was shipped separately. I thought the product was well worth the money. I am giving the ornament to my Goddaughter's step-daughter for Christmas. Purchased as a gift for someone who loves penguins. I was more impressed with the actual item as the photo does not really do it justice. Product is well made , but I would like a bigger selection. I buy an ornament for my son and daughter in law every year to celebrate another year of marriage the same way my husband and I did until he passed away. The ornament was very nice, but I would like a bigger selection to choose from. If there were more to choose from they would not get the same ornament every other year. There used to be bells and angels also that could have the name and date on them. 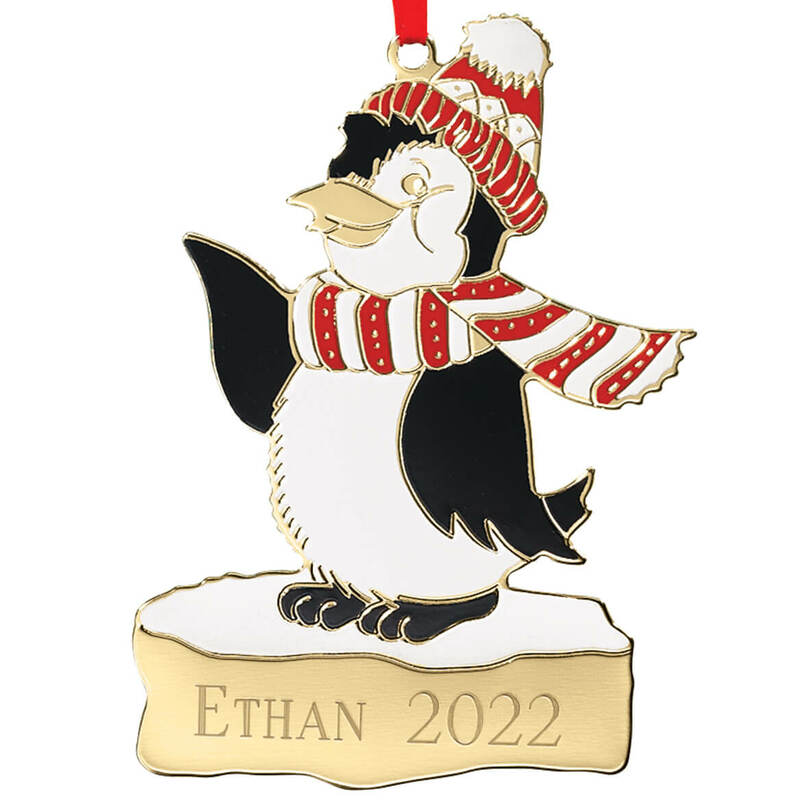 This is a beautiful ornament!...great price...fast shipping for free!..customer for life! My daughter is into penguins this year we always get an ornament for her so this was a perfect fit she love it. I brought this ornament for mom. She loved it. great for adding to grandkids' ornament collections - one for each year. Love them. I would buy this again and I would recommend it. Cute ornament, however I received this with no way to hang it. I ordered 3 ornaments and had to go then find either hooks or cording to hang them. You would think it would come ready to go? Totally pleased with product and personalization was excellent. Pros - Bought it as a Christmas gift. Very cute and seems durable. Person who received it loved it. Cons - [...]. Wish the engraving stood out more. I originally ordered another personalized ornament, but the purchase was cancelled. It is cute and my grandson will love it! I like to get personalized brass or gold ornaments. Cute item. I give personalized ornaments yearly to family. I rthought the item was very cute and I like the quality of Miles Kimball's merchandise. I have getting personalized brass ornaments each year I have been married and this one I didn't have. 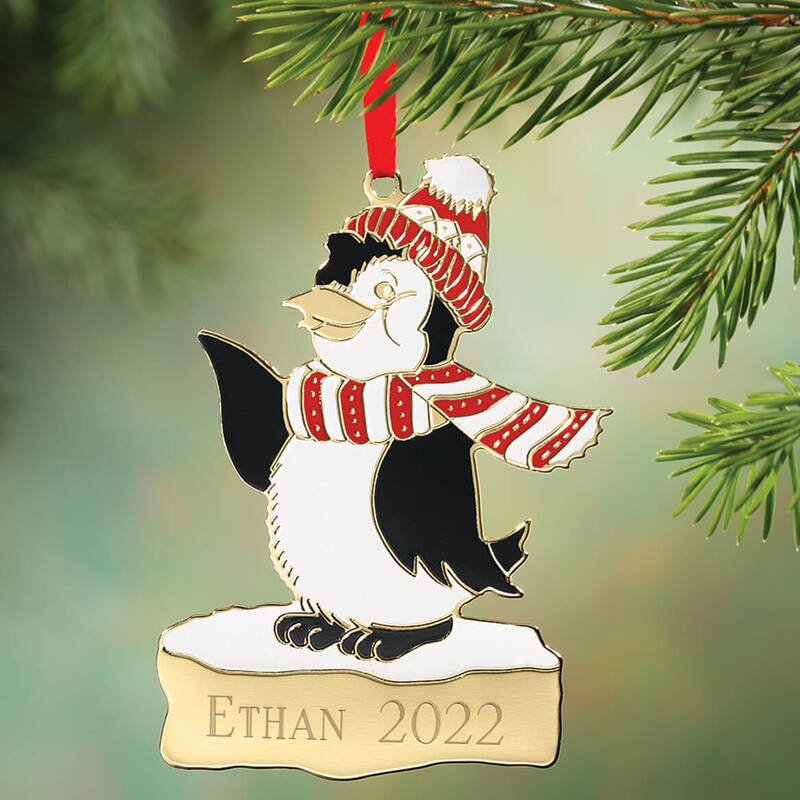 Wanted a personalized ornament for a love one she loves penguins! It's for a niece that's 3. I do ornaments as a tradition. for my daughter. To continue the tradition of the personalized ornaments that my husband and I received as children. Always get ornaments from you. I tried to match the personalities of my grandchildren. I ordered this 3 times on line and by phone and it never came. I'm hoping 3rd time is a charm. I have a niece who loves penguins and this will make her Christmas next year. Personalized brass ornaments have been a tradition for about thirty years. Thanks for keeping the tradition alive. I have been collecting gold personalized ornaments for over 30 years and have a great display. 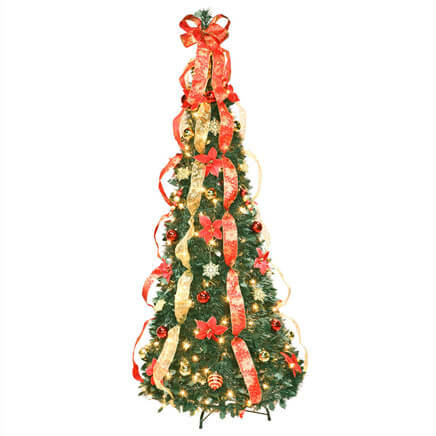 Very cute ornament and it look like good quality. I am trying to keep up the tradition of buying brass ornaments for my loved ones for Christmas. Bought one last year for my oldest granddaughter, and this year I bought her this one, and another for her new little sister! 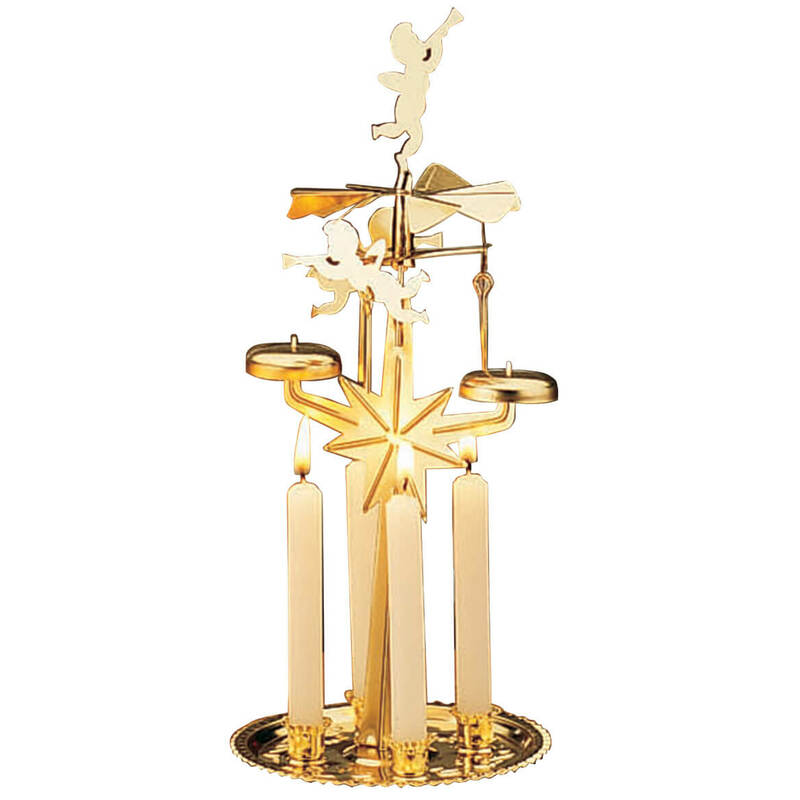 Use these candles with our angel Christmas candle carousel - a holiday tradition your family will cherish! 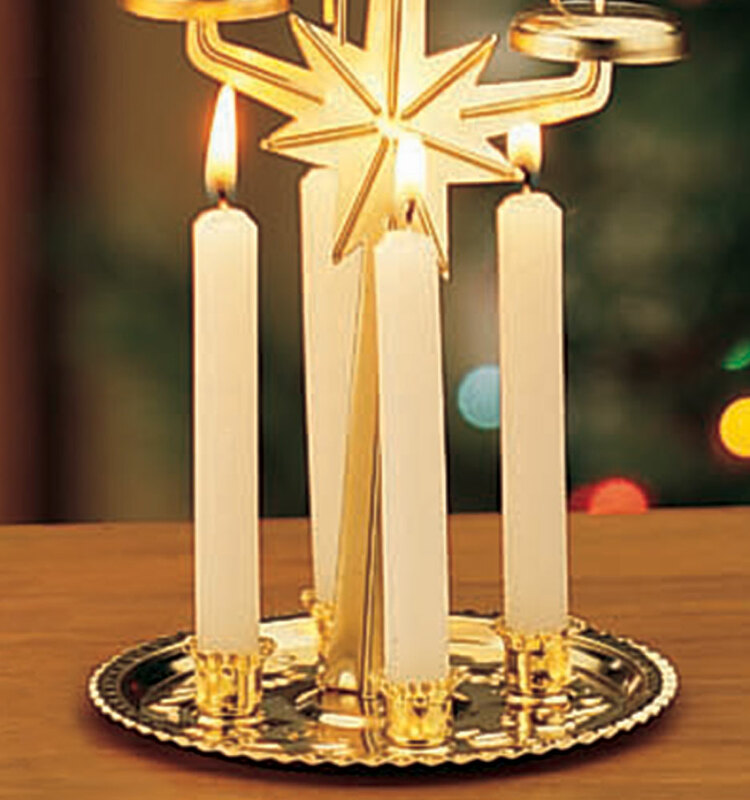 4" H holiday candles. Specify red or white.